As spectacular as Arno Bernard‘s 2015 Featured Knife is — this one is handled in sheep horn — the sheath is just as wonderful. It carries the knife horizontally on the belt, set up for right-handed crossdraw, and is quite comfortable. And it’s handcrafted from cape buffalo hide — both exotic and gorgeous. 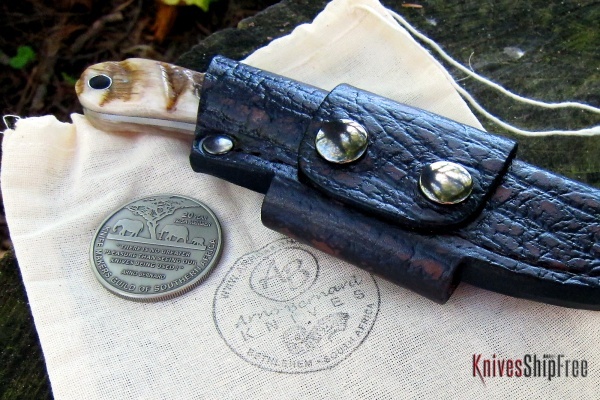 This entry was posted in Arno Bernard Knives, Hunting, Sheaths, Traditional and tagged Bone, Leather. Bookmark the permalink.